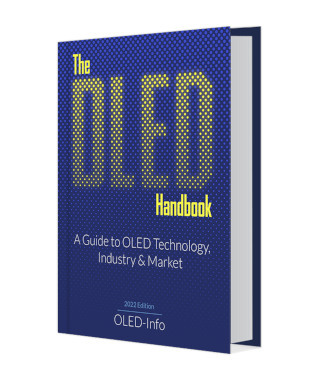 I'm happy to announce the fourth edition of The OLED Handbook, the most comprehensive resource on OLED technology, industry and market - now updated for 2014. The OLED industry still grows and changes very fast, and the new edition include new details the OLED TVs and flexible OLEDs, in-depth look into encapsulation technologies and of course many updates on the OLED display and lighting markets. The book includes over 40 new companies and has a better organization. The OLED handbook has been read by hundreds of display engineers, business developers, researchers, equipment vendors, OLED material companies, private investors and others who wished to learn more about OLEDs today and in the future. I truly believe that it is the best introduction to OLED displays and lighting! The OLED Handbook 2014 edition can be downloaded now for $97 USD (via Paypal or credit card). To secure your copy simply click here. Existing digital-copy customers are entitled to a 50% discount (and if you bought in 2014, you'll get the upgrade for free). If you did not receive your upgrade coupon, contact us to get one. The hardcopy printed version costs $149.99 and can be ordered through our publisher. The OLED Handbook 2013 edition released! The OLED Handbook 2012 edition released!